This San Diego landmark restaurant has been serving the best subs and homemade Italian specialties you have ever tasted. As a matter of fact, it’s not uncommon for people “in the know” to drive over 20 miles just to eat here. Topping the list of favorites is Poma’s incredible roast beef sandwich. This isn’t just another roast beef sandwich. First the beef is marinated. Then it’s slow roasted to perfection, making it moist, tender and flavorful. No kidding – this is a great sandwich. Their meatball sandwich is a close second. All of the sandwiches are made with freshly baked bread from San Diego’s famous Solunto’s Bakery in Little Italy. The lasagna, spaghetti, pizza and salads are also winners. Read the 50th Edition Now! 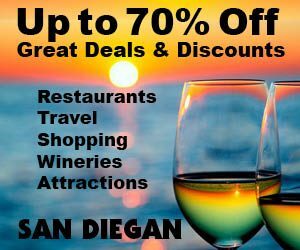 We’re the #1 City Guide with personally researched & reviewed content based on the print version of Barry Berndes’ SAN DIEGAN, who appears on the cover of all of his books dining in great restaurants. 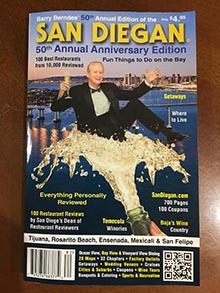 Since 1969, Barry has been engaged in writing the “Honest Guide” to San Diego, by reviewing every aspect of his hometown including dining in 1,000’s of restaurants. He goes unannounced, paying for his own meals and inspecting the kitchens of each restaurant he reviews. This is your assurance that you will receive the same experience he enjoyed. With over 5 million copies in print, he has gained international recognition with numerous on air interviews and numerous articles written about him. As a result, 6.8 million locals, newcomers and visitors actively follow his recommendations annually online and in print, and so should you. ©1995-2019 | San Diego Guide Inc.